Jack Bauer still has big screen dreams. 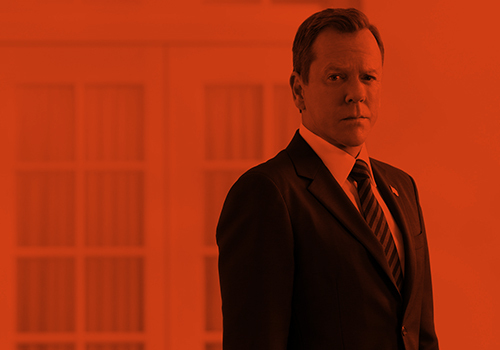 Though Kiefer Sutherland and 24’s executive producers Howard Gordon and Evan Katz originally intended to bring Jack Bauer back in a movie, fans were disappointed when 20th Century Fox announced that they would not be moving forward. Fortunately, Jack would live to see another day as Fox is set to bring 24 back as a 12-episode miniseries, titled 24: Live Another Day, later this spring. But that doesn’t mean Sutherland has given up on the idea of a 24 movie, or even rebooting the series! Sutherland, Gordon, Katz and executive producer Manny Coto teased the series’ highly anticipated return at the 2014 Winter TCA Press Tour on Monday, revealing plot details and why they haven’t given up on the idea of a 24 movie. Jack Bauer to the rescue, indeed! Enter fan favorite Mary Lynn Rajskub, who is set to return to the series as Jack’s trust tech master sidekick Chloe, but don’t expect to see a warm reunion between the two. “They’re actually pitted against each other…that is a dynamic that Mary Lynn and I get to play that’s very exciting. It’s always something that’s going to evolve over the course of the show,” Sutherland teased. 24: Live Another Day will premiere on Monday, May 4 on Fox. This entry was posted by Courtney on Tuesday, January 14th, 2014 at 2:18 pm. It is filed under 24, News. You can follow any responses to this entry through the Comments Feed.